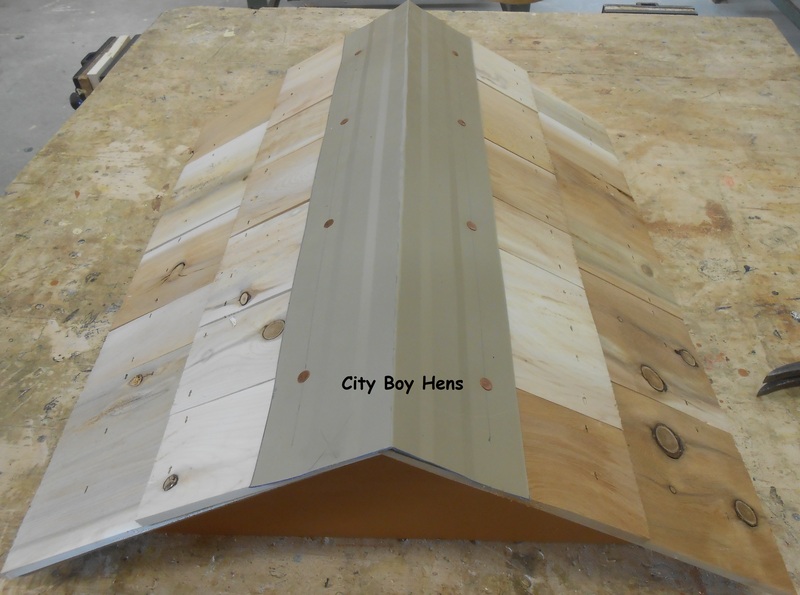 A screened bottom board is a great addition to any beehive. It not only provides great ventilation for the hive, but can also be used in your IPM (Integrated Pest Management) practices to help determine the number of Varroa mites that are in your colony. The premise of this theory works like this: Count the number of mites that have fallen off the hive and have adhered to the “sticky board” over a 24 hour period. Compare this number to the “threshold numbers” that are recommended by your local beekeeping agency. For example: where I live, the governing agency recommends that a treatment be considered when 9 mites are found on the sticky board in a 24 hour “drop” during the month of May. Initially, I thought that this would be a great way to determine if I would have a future mite problem (levels above a particular threshold). But then I came across a different theory which argued that the number of mites found on the sticky board may not be an accurate way to determine if your hive is infested with mites. The rational for this was that hygienic bees may be better at removing mites from each other and, therefore, you may not have an infestation, but rather, bees that are very good at removing these beasties from the hive. GGGGGGGRRRRRRRRRRRRR! Beekeeping………….Nobody ever seems to be on the same page! A) The mites that do drop off will fall through the mesh and (from what I’ve read) not be able to crawl back up into the hive. B) The sticky board will allow you to monitor how many mites will drop in a 24 hour period. 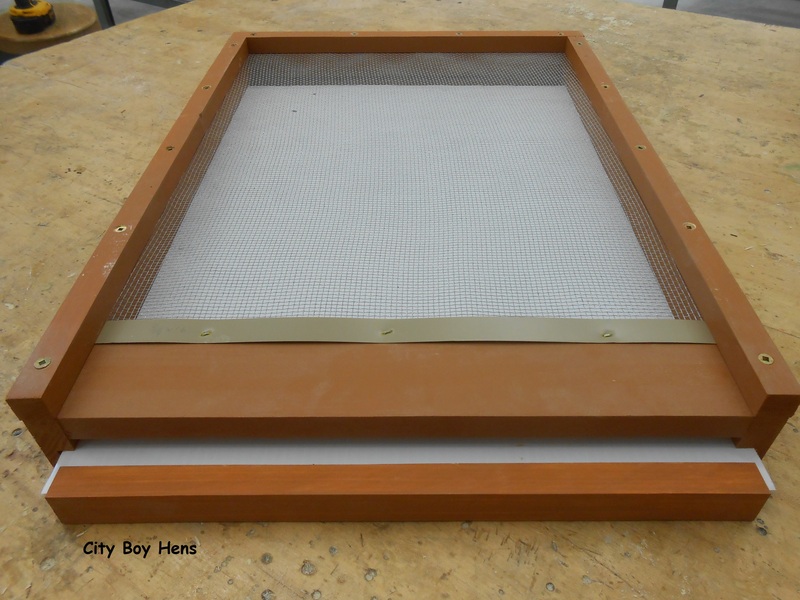 C) The screened bottom board ( without the sticky board is place) provides great ventilation for the hive. This will be extremely useful through the entire year to help rid the hive of excess moisture. This is just as important in the Winter as the Summer. So…I decided to make a screened bottom board that would have a sticky board that could easily slide within the bottom board. The entire “unit” will be made up of 2 sections that, when combined will become the final bottom board. Cut all pieces to the above measurements. 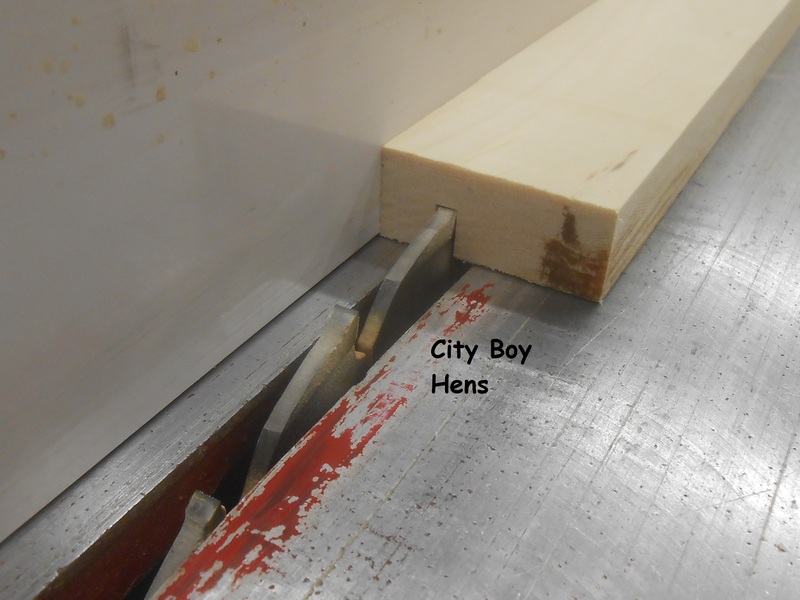 Using a table saw, rip a 3/16″ wide x 1/4″ deep channel through the inside of the sides, back and the sticky board front. This channel will allow for the sticky board to be positioned in the bottom board when in use. I set the table saw fence to 7/16″ and made sure to put the bottom of each board against the fence. Next, counter sink the screw locations to put this section together. (Note: Set the sticky board front aside for now. It’s not getting assembled with these pieces.) I used 1-1/2″ deck screws for this job. Now screw these pieces together using a good exterior glue. I used coroplast for my sticky bottom board. You can get it at a sign shop or, better still, re-purpose an old real estate or election sign if one is available. 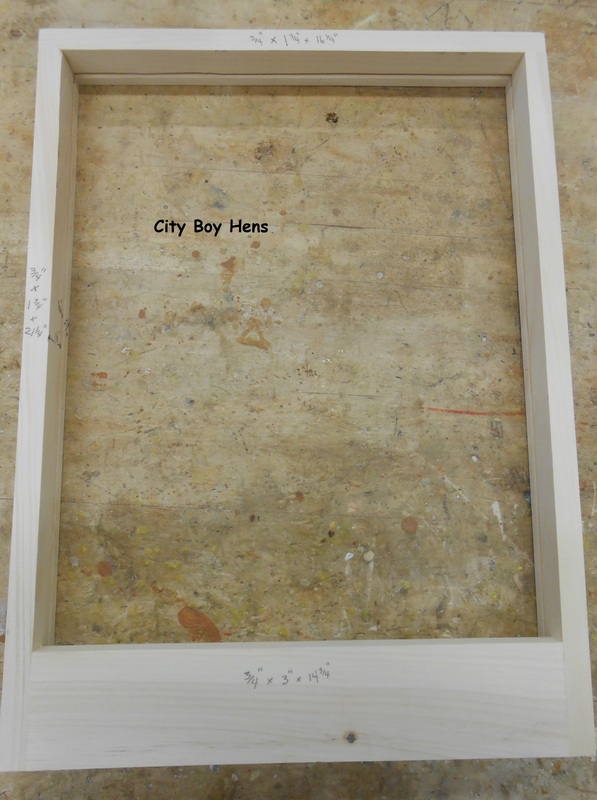 I cut it to 15- 1/8″ wide x 20-7/8″ long and glued the end (using construction adhesive or silicone) to the sticky bottom board piece that you previously put aside. Now, fill all screw locations with wooden plugs, flush cut each plug and sand the frame. Now is a good time to paint all the parts of the bottom board. Cut a piece of #8 hardware cloth for the size of the bottom board. Use must use #8 because it is small enough to prevent your bees from going through these holes. Staple it to your frame. 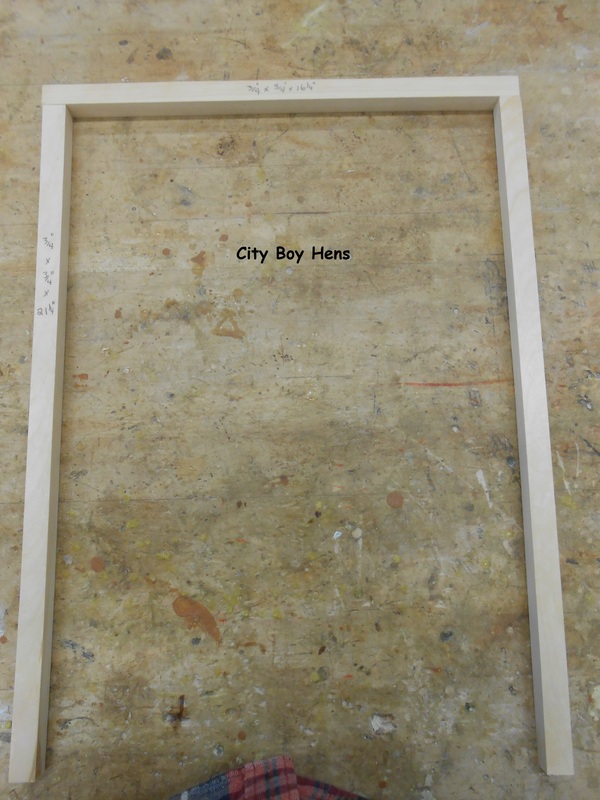 Next, staple a thin piece of metal or wood to the front of the screen and screw the 3 pieces of wood from section #2 to the frame. I used a counter-sink bit to ensure that I did not split these pieces. And…there you have it. 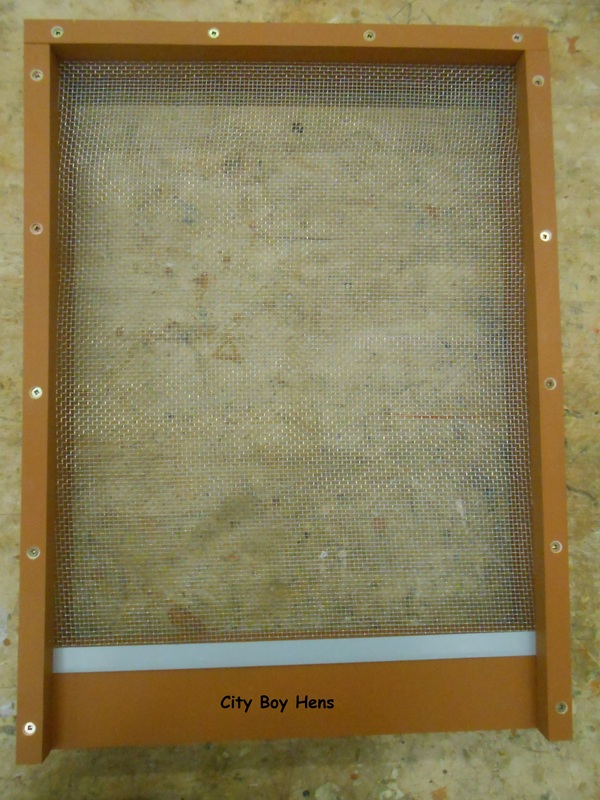 A home-made screened bottom board. Your bees will be delighted with all the ventilation for your hive. As well, you’ll be able to begin monitoring for mite levels as well. 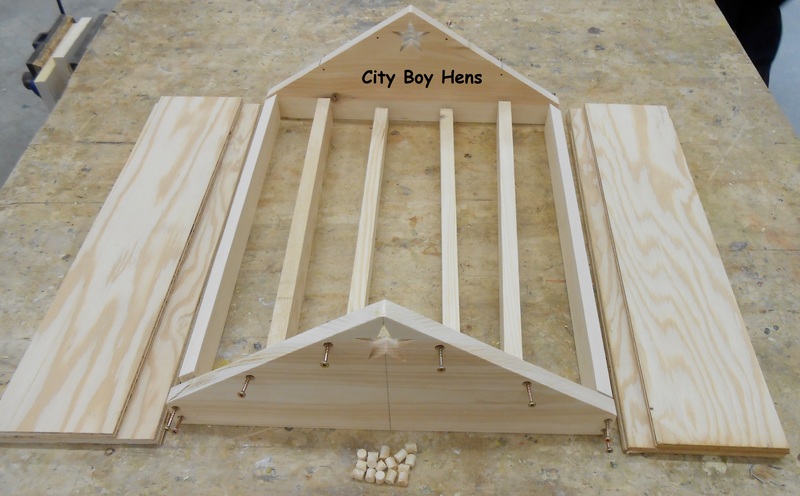 Please CLICK HERE if you would like to view my other posts on making your own beehive. I spent a lot of time deciding on what type of cover I would build for my beehives. I can’t say that I am too impressed with the look of a standard telescoping cover. I guess that’s because it is designed to be functional and esthetics do not play a role in the business of professional beekeeping. After searching for ideas, I came across an informative post at Honey Bee Suite on The Best Ventilated Gabled Roof. This roof had the right combination of purpose and esthetics. I liked the idea of incorporating ventilation into the roof and the look of a gabled roof on top of a hive looked great. 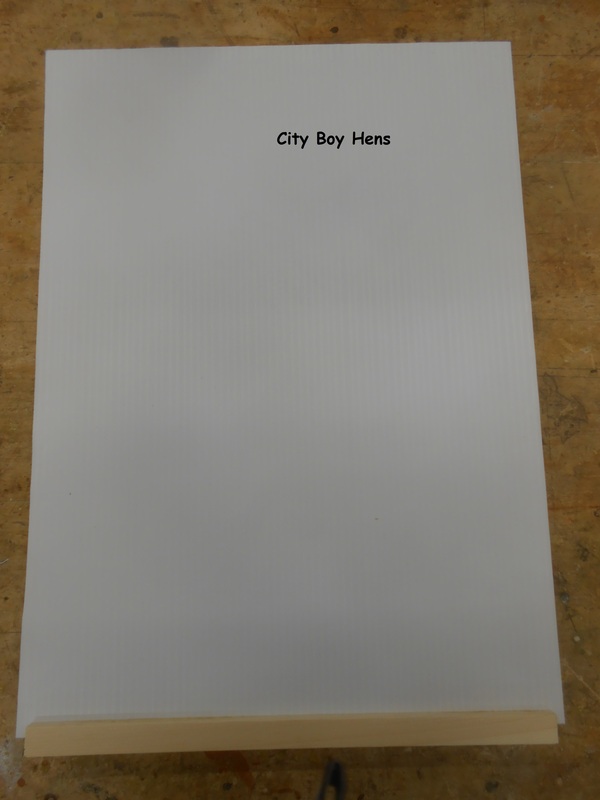 Now… I just had to give it a few City Boy extras in order to personalize my hive. Make sure that you read and understand how to SAFELY operate your power equipment. In some of the pictures below, the safety guard has been removed so that you can get a better understanding of the photo. NEVER operate your equipment without a guard in place! Dress 2 pieces of pine to 3/4″ thick x 7-1/4″ wide x 18 1/8″ long. 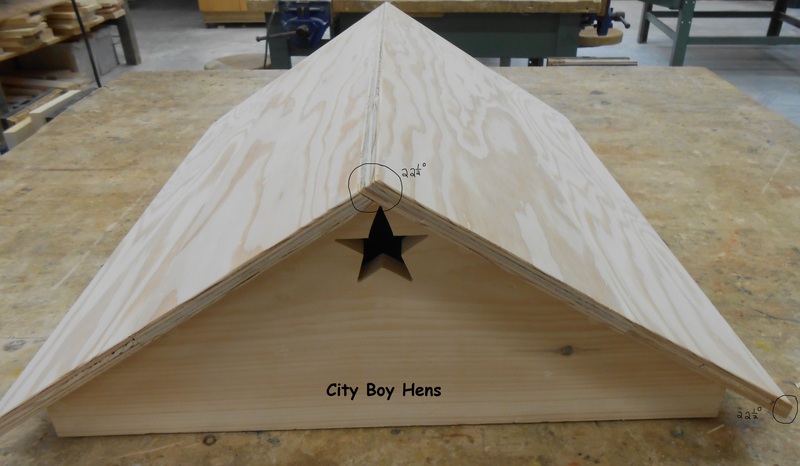 Now layout the lines for the end gables by a) making a mark 1-1/2″ up from the sides of each gable and b) making a mark at the peak of the roof. 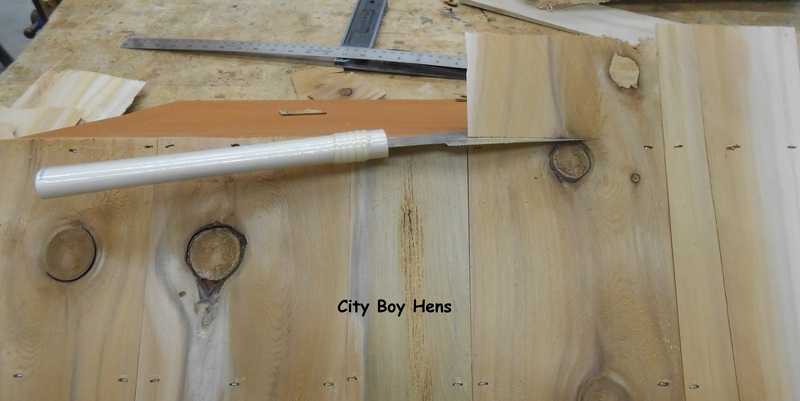 Now connect these points and cut the gabled ends with a band saw or jig saw. Now, draw out the design for your ventilation access. I made a star because it ties in with the design on my chicken coop door, but you could give it your own personal touch. A scroll saw makes for accurate work in cutting out the design. 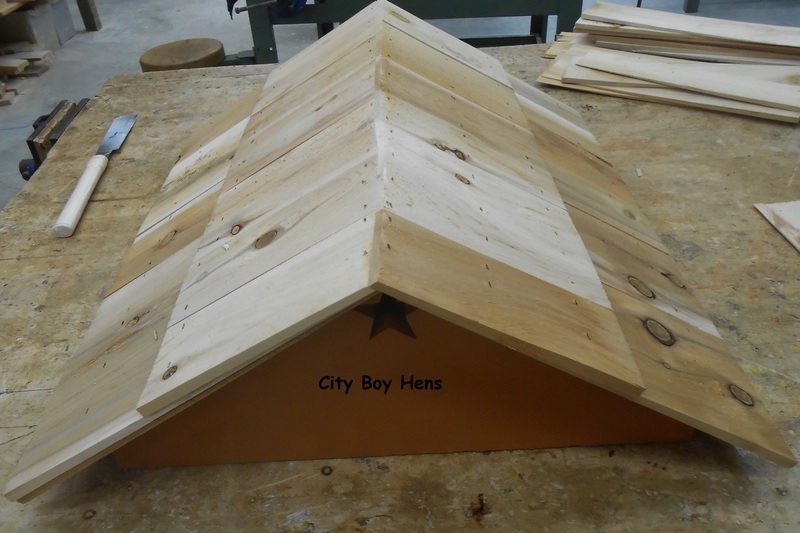 Next, cut the sides of the roof to 3/4″ thick x 2″ wide x 20-1/4″ long. 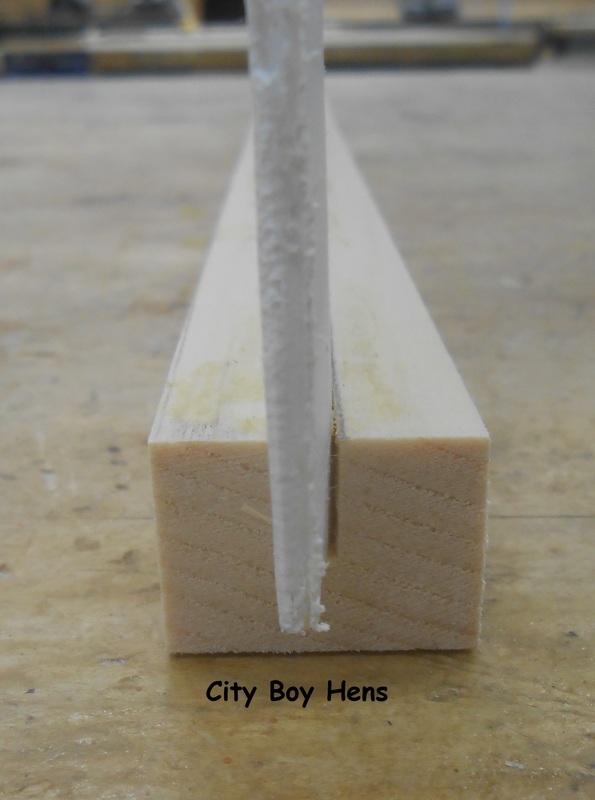 Now set your table saw or bandsaw to 22-1/2 degrees and rip these 2 pieces to 1-1/2″ in width. 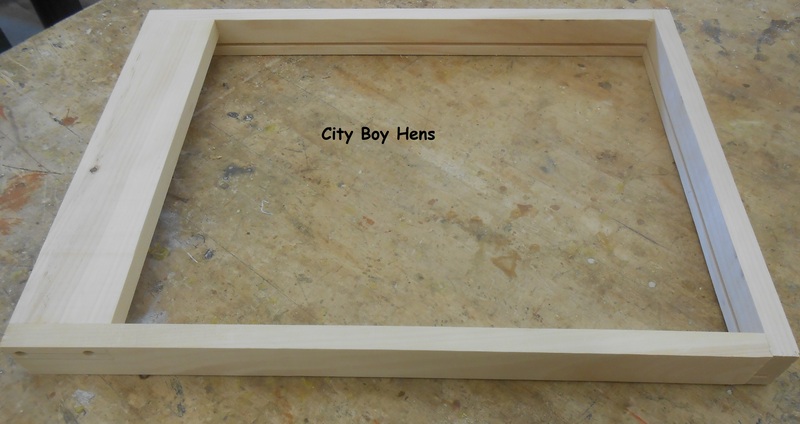 ( This will allow the plywood roof to rest perfectly on the sides). Next, cut the 4 structural supports. 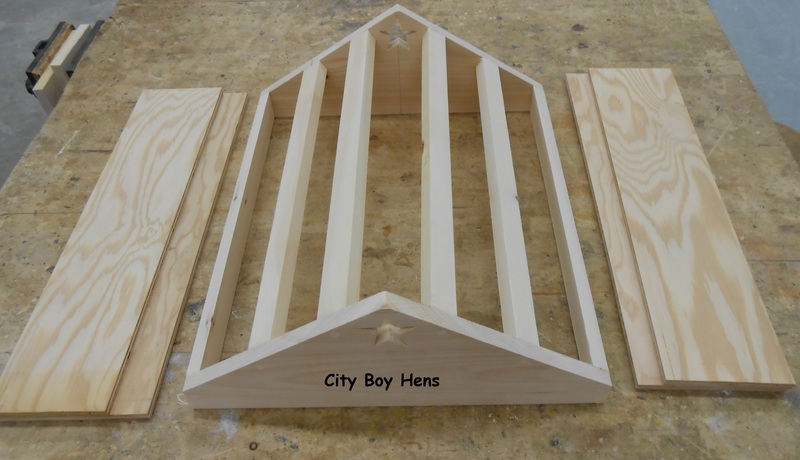 These supports will tie both gabled ends together and provide a nailing surface for your plywood top and shingles. You don’t have to be too fussy about the width of this material because it won’t be seen. Just make sure that they are at least 1-1/4″ wide and 20-1/4″ long. 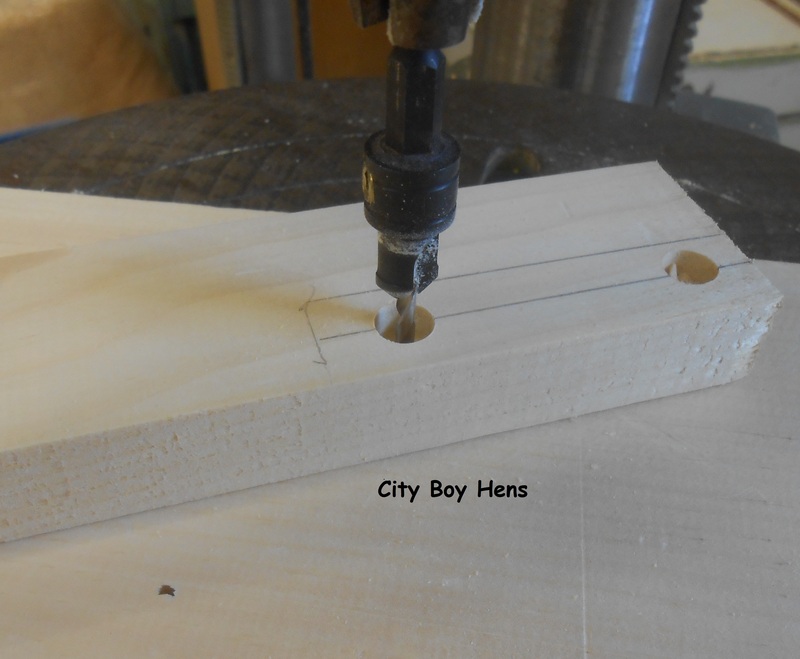 Next drill (using a countersink bit) the screw locations into each gable end in order to attach the side pieces and structural supports. 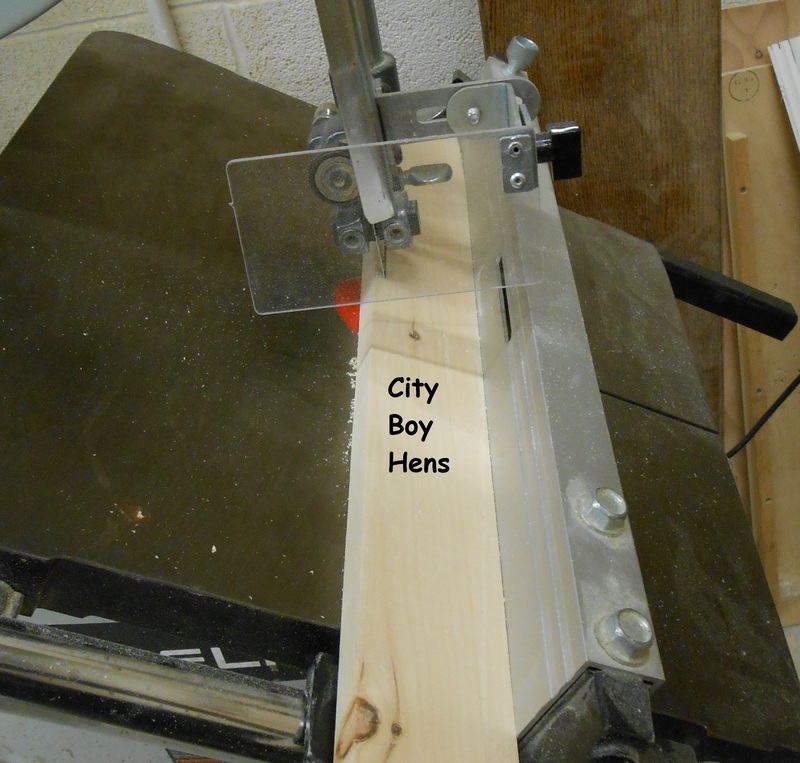 A drill press works great, but a hand-held drill will work as well. Use exterior glue and 1-1/2″ deck screws for assembly. Now, fill each screwed hole with a wood plug and trim the plug with a japanese flush cutting saw. This would be a good time to staple screening over the inside of the ventilation star. I saved this step until I made the entire project and it was a bit more challenging later on. 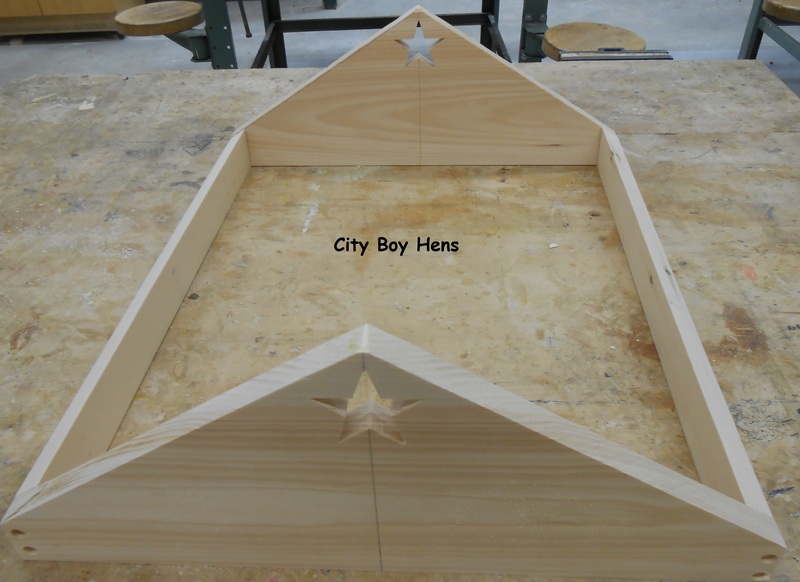 I made the roof from some scrap pieces of 1/2″ plywood. 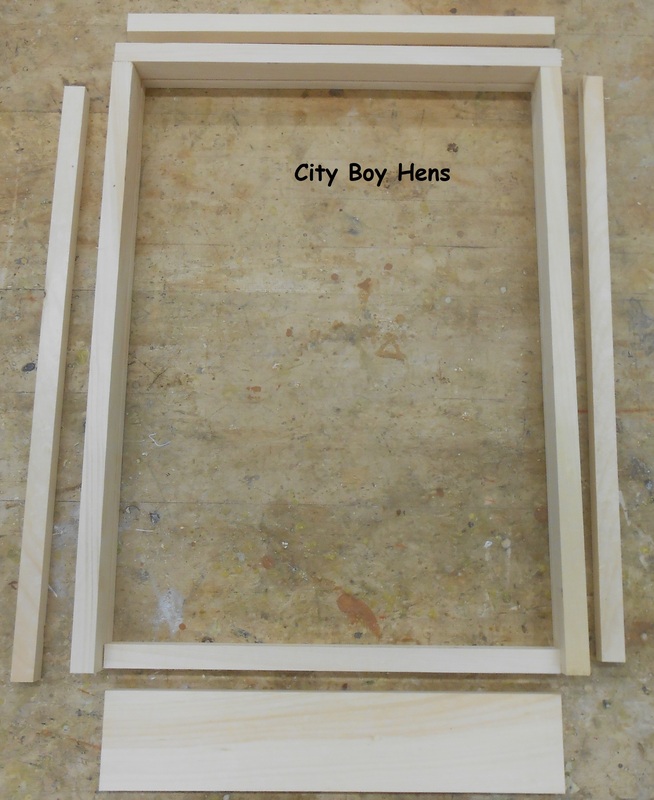 One side will be 1/2″ x 12-1/2″ x 24″ and the other side will be 1/2″ x 12″ x 24″. The reason for the difference in the width is for the overlap at the peak of the roof. 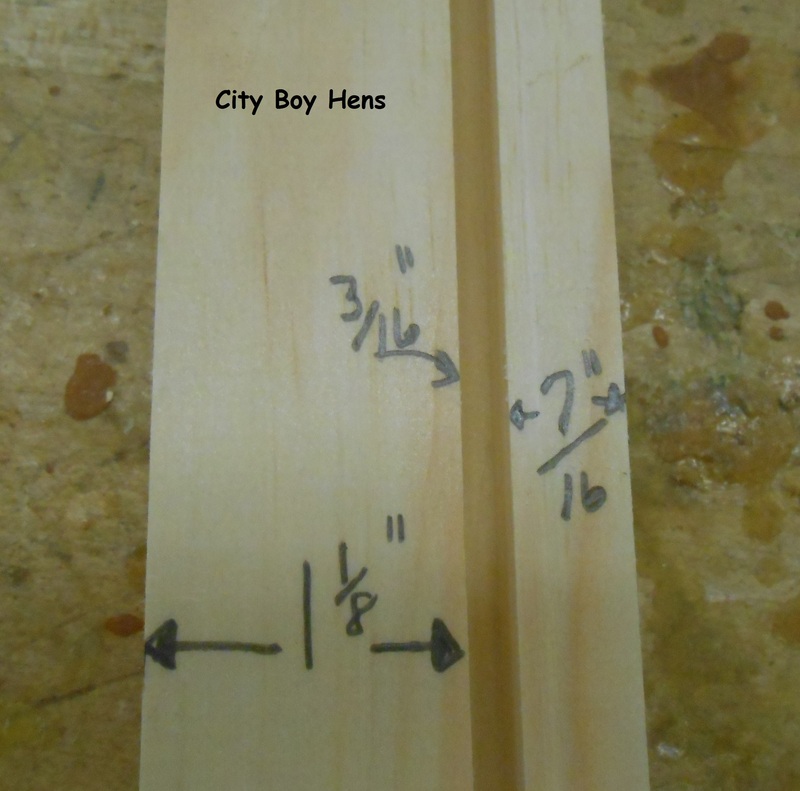 Now, rip the length (edge) of each board at 22-1/2 degrees. This will make for a tight peak. Now flip the plywood over if it’s one solid piece and rip the other edge (bottom of the roof) at 22-1/2 degrees. If you are using 2 pieces for each side of the roof (like I did) than just rip the second board at the same degree. 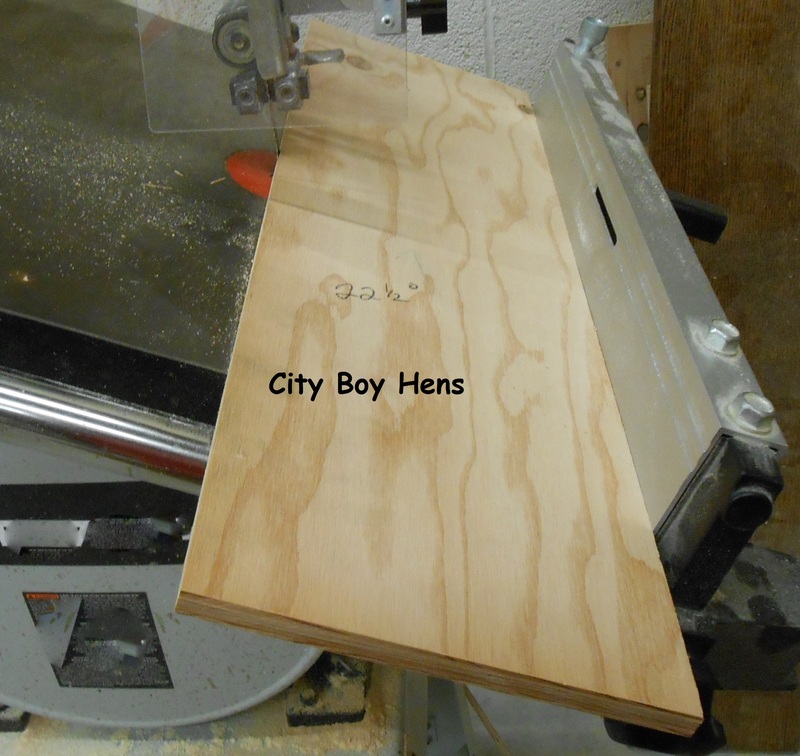 The table saw or band saw works good for this step. This is a good time to paint the exterior or the entire project. 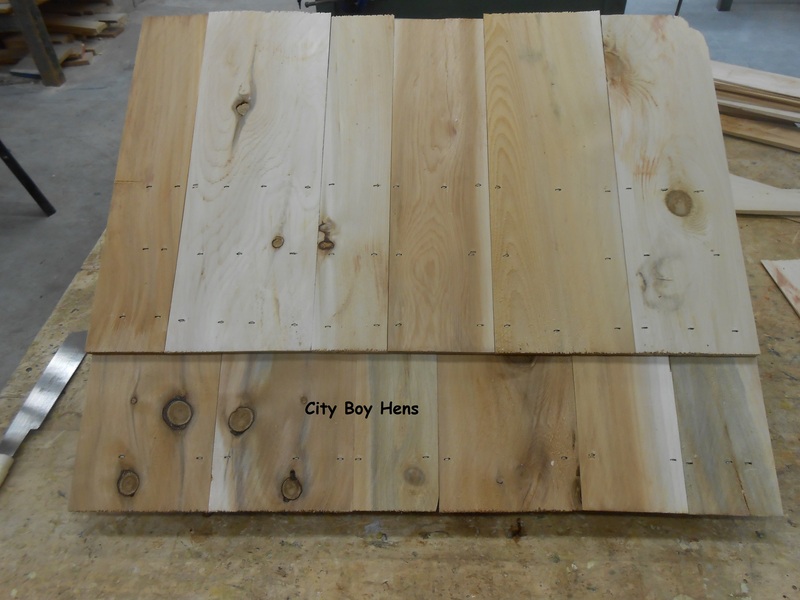 I used cedar shingles because I like the look and the hives will tie in nicely with my shed/chicken coop which is also shingled in cedar. You can also use asphalt if you prefer. Either way, just make sure to double your bottom course and not to have the gaps between shingles identical on all courses. I used a pneumatic stapler to secure the shingles to the roof and marked my location in order to drive the staple into the plywood and structural supports. * Note: The shingles overhang the roof sides and bottom by 1″. First start by stapling the first course and trim the shingles at the top of the peak with a fine tooth saw. Now secure the next course right on top of the entire first course, making sure to not align this course over the sides of the previous course. This will help keep moisture from penetrating to the plywood. Next, put your third course of shingles on, making sure to start them further up the roof. Follow up by trimming the shingles at the roof peak. I cut some repurposed coated metal roofing for a cap. The measurements were 7-1/2″ wide x 26″ long. I bent the metal on a sharp edge and attached it with 8 roofing nails. Make sure to pre-drill each location first with a metal bit that is 1/16″ less than the diameter of the nail. And there you have it. I think the gabled roof is a great addition to my hives. I hope you give it a try! 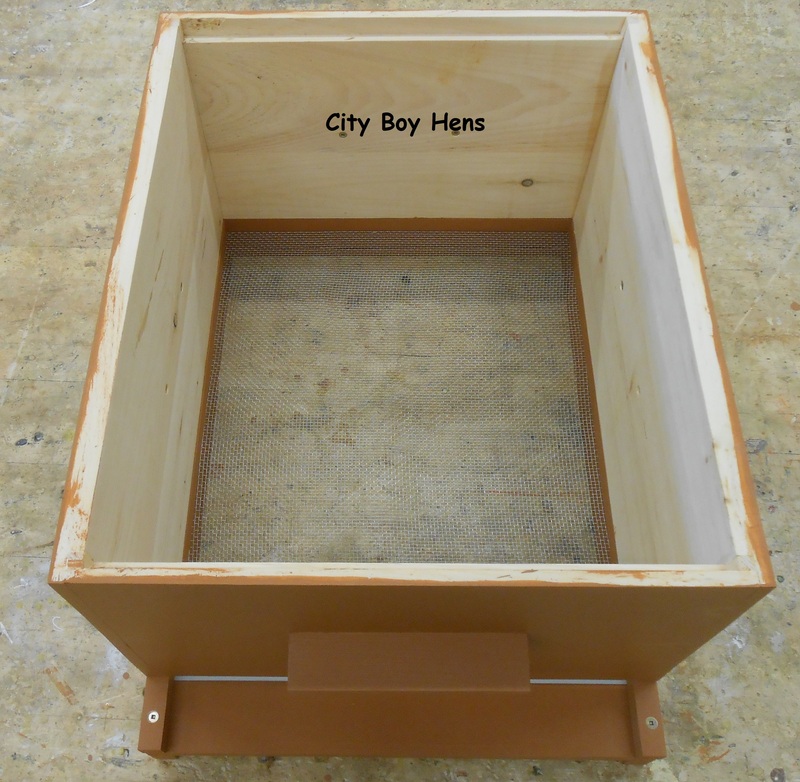 If you would like to learn how I built my hive boxes CLICK HERE. 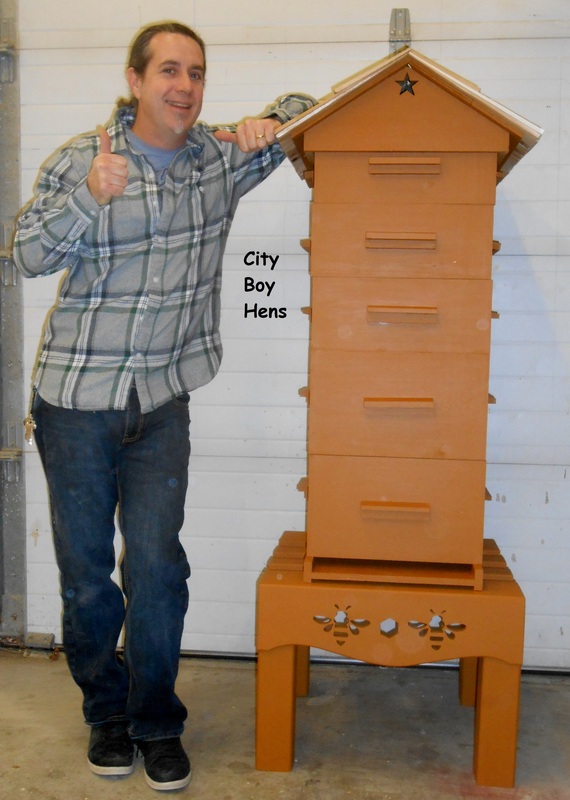 If you would like to learn how to build the elevated hive stand CLICK HERE.